A high-speed crash took several riders out of the Vuelta a España late in Saturday’s eighth stage. More than two dozen riders crashed about 50km from the stage finish as the peloton powered into the outskirts of Murcia, nearing the first of two trips up the Cat. 3 Cresta del Gallo climb. Tejay Van Garderen (BMC Racing), Dan Martin (Cannondale-Garmin), Kris Boeckmans (Lotto-Soudal), Nacer Bouhanni (Cofidis), and even eventual stage winner Jasper Stuyven (Trek Factory Racing) were among those hitting the pavement in the big pileup. Boeckmans appeared the most seriously injured. According to a team press release, the crash left him with a concussion, severe facial trauma with several fractures, three broken ribs, and bleeding in his lung, forcing him out of the race. “I was riding just behind him when it happened,” said Lotto-Soudal’s Tosh Van der Sande. “He was drinking when he rode over a hole, tumbled over his handlebar and hit the ground very hard. 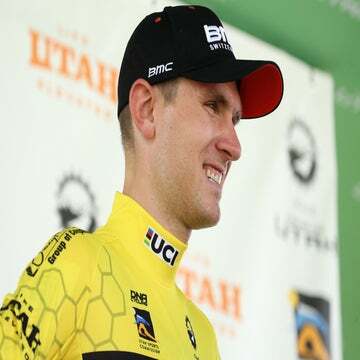 Van Garderen suffered a broken shoulder in the the crash, and early reports suggested Dan Martin might have suffered a broken clavicle. Nacer Bouhanni, who had already hit the deck several times in previous stages, was also brought down hard in the pileup. All three riders abandoned the Vuelta. “We were coming into Murcia. It was a typical crash, everyone’s lined up, we’re entering the city, there are nerves, someone touches wheels, and you fall in a funny way, and race is over,” van Garderen’s BMC Racing teammate Samuel Sánchez said of the incident. After falling hard and hurting his wrist, Stuyven managed to catch back on to the peloton and ultimately took the stage win, before further examination revealed that he had suffered a broken scaphoid bone in the crash. Trek Factory Racing announced his withdrawal from the Vuelta following the victory and the subsequent discovery of the full extent of his injury. Overnight leader Esteban Chaves (Orica-GreenEdge) was among the many others to also hit the pavement in the pileup, though he quickly regained contact with the main bunch ahead of the two finishing climbs and finished safely within the bunch.